Download the GAMP package via the above svn command. Move the folder "gampmatlab" to the location of your choice. Add this location to MATLAB's path. Read the README files associated with GAMP and EMGMAMP. Run the EMGMAMPdemo.m file located in the "examples" folder to ensure that EM-GM-GAMP is working properly. The MATLAB script used to generate the example on this website is located here. 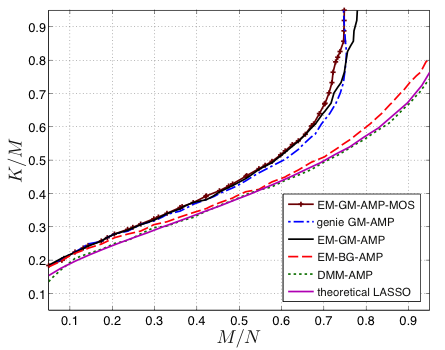 To reproduce the results in the EMGMAMP journal paper, simply download the zip folder here. Each experiment located in the "CStests" directory saves the needed metrics for one realization. One simply needs to obtain the GAMP sourceforge package above. For convenience, all other (publically available) algorithms are provided in the "CSalgs" directory.